Once upon a time a woman began writing down the stories her father told about growing up in Baltimore during The Great Depression. Knowing that one day her father would not be around to share them, she wanted to make sure that they weren’t lost for her children and grandchildren. She had always been entertained by the antics that seemed to be an everyday part of his younger life, and she loved the way his eyes would twinkle when he told those stories. As she began to write down those stories, they took on a life of their own and became a work of fiction – my work of fiction. Yep – I’m the woman! 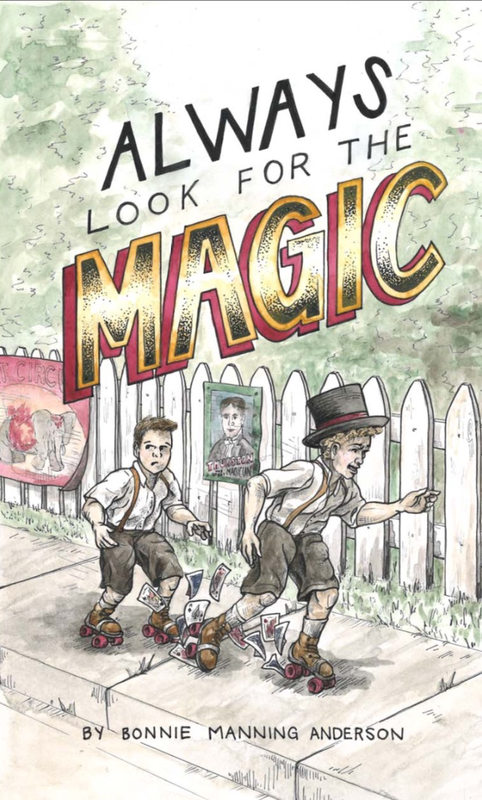 So, here’s the BIG ANNOUNCEMENT: I’m excited to tell you that my new novel, ALWAYS LOOK FOR THE MAGIC, is now available on Amazon, both in print and digital formats! This is a light-hearted book, full of warmth and laughter, that will be enjoyed by people from 8 to 88. I hope you will click on over there and order a few dozen for yourself, your children, your grandchildren, your neighbors, and your neighbors’ children. Also, after you read it would you kindly give me a review on Amazon? That would be so helpful. Thank you! 1 entry for commenting on this post. 1 entry for sharing on Facebook. 1 entry for sharing on Twitter. I will do a random drawing tomorrow (Thursday, Feb 1) at noon and announce two winners. Winners must reside in the United States.